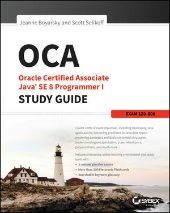 First of all 1Z0-851 (Oracle Certified Professional, Java SE6 Programmer) as I saw some people get confused with name and code of the exam. I cleared the exam on 4th October, 2013. Yeah, I'm late in posting result here but "better late than never ". For preparation I read SCJP by Kathy and Bert. Plus some conceptual material from indiabix.com as they have question with detailed answers. Whole preparation took 8 weeks, actually 7 but I postponed exam because I was bit scared to lose marks on drag and drop questions, which were not present on the exam .